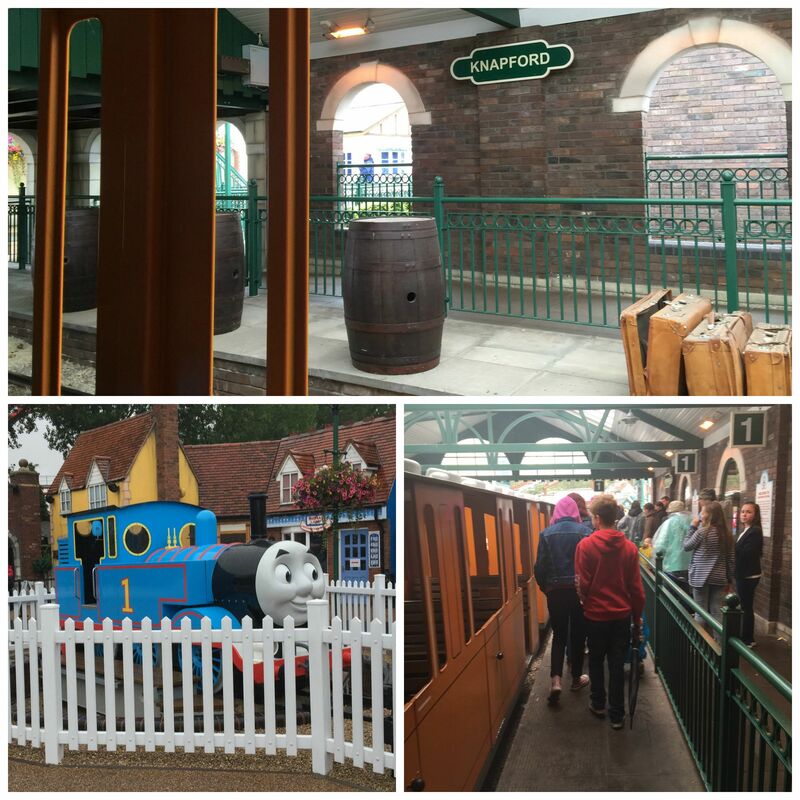 A few weeks ago we were lucky enough to be asked along to Drayton Manor to visit Thomas Land for the day. We know that a lot of you have been before, but this was our first visit. I was VERY excited! I have become a huge Thomas the Tank Engine fan, and have been watching him and all his friends on TV and YouTube. I couldn’t wait to visit and see what it was like. 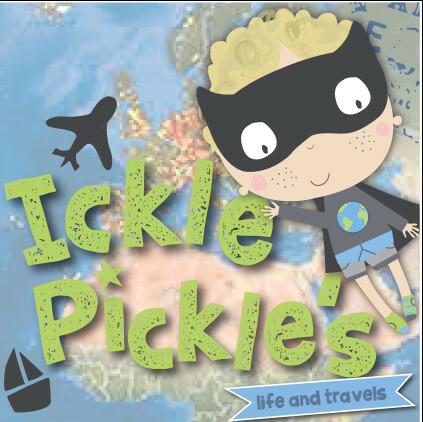 Even more exciting for Mummy was that we were meeting the lovely Zena, from Zenas Suitcase and her family too. 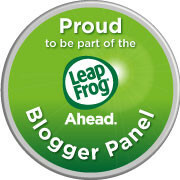 Mummy and Zena have become bestest friends, and do a lot of bloggy stuff together. There was only one little problem as we woke up on the day we were visiting. It was absolutely pouring down with rain. And it did so all day. This did have an effect on the day, and the things we were able to do and see. Although we had a brilliant day, we all know that it would have been even better on a dry day. 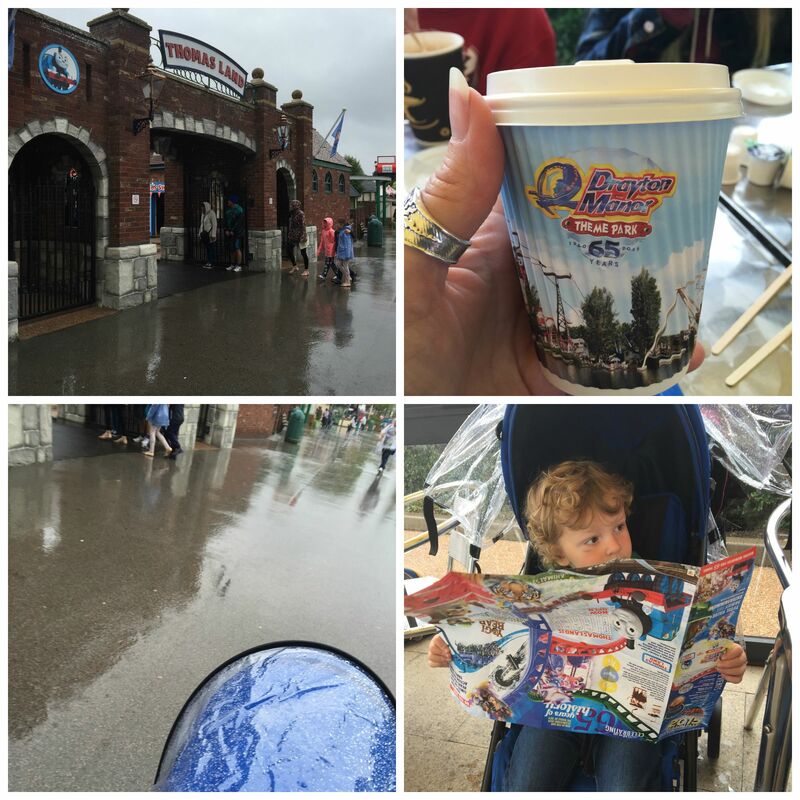 It wasn’t just a few showers – the rain bounced down, heavily, all day. 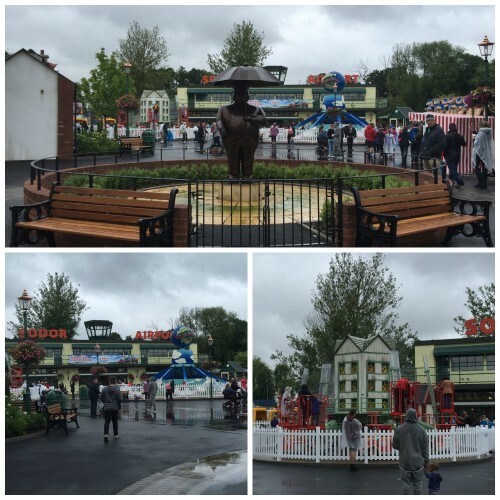 The car park is only a quick walk to the main entrance, thank goodness, and we arranged to meet Zena in Thomas Land, to the left as you go into the main park. Mummy needed coffee, and there was a good undercover seated area opposite a coffee shop. We luckily managed to grab a table, and I planned where I wanted to go! Thomas Land has eighteen different rides and attractions, we managed a little look around, but everywhere was so very wet. The good thing was that there were almost no queues! Zena is an Ambassador for Drayton Manor so we asked her to show us the best parts and rides for my age – I am 3 in October. All I wanted to see at first was Thomas – and I wanted to go on him too. I was so super excited when we found him! He was waiting in a little station to take his passengers over to another part of the park. 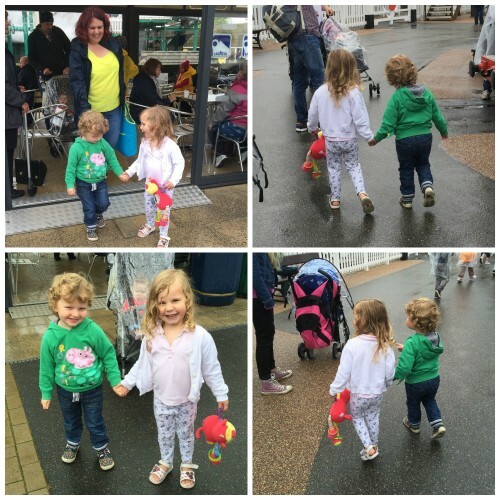 He was taking it in turns with Percy – Rosie helps too, but we didn’t see her. 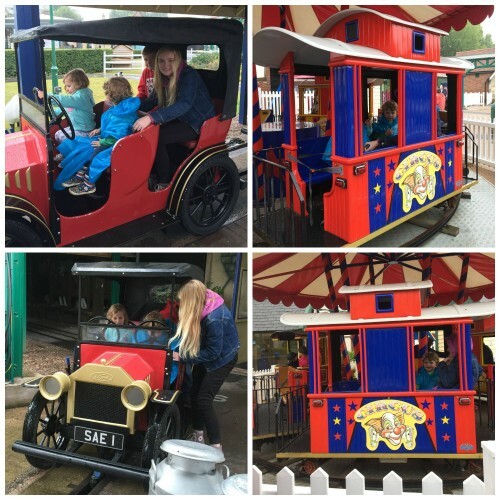 As much as I wanted to ride on the Thomas train straight away, Mummy and Zena said it would be fun to go on some rides first. It stopped raining for about two minutes before it poured down again. Princess (Zena’s little girl) was very excited to take me on Harold’s Helicopter Tours Ride, and Mummy and Zena sat in the back whilst we ‘flew’ the helicopter. I had never been on a ride that goes up before, and I loved it! Next we went on the Bertie Bus ride, Mummy, Lea and Luke came on with Princess and I whilst Zena went to the shop to get some rain ponchos for us. 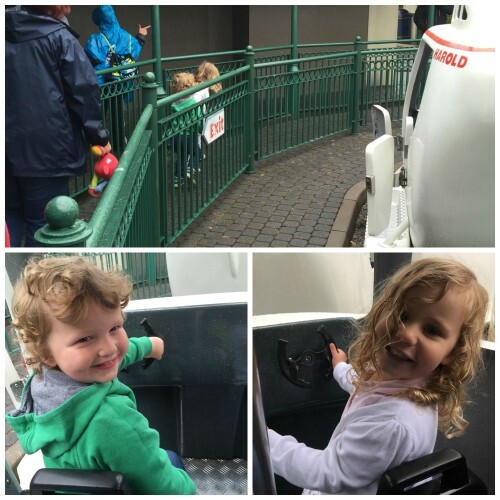 We climbed onto Bertie – thank goodness we were under cover – then Bertie swung round and round! It made my tummy feel a bit funny, but I loved it! We went up high again too. We also went on the Sodor Classic Car ride and Lady’s Carousel – both of which kept us dry! Our Thomas Land rain ponchos were a bit big – but they kept us nice and dry! We did go on the Thomas Train at last, and I loved it! 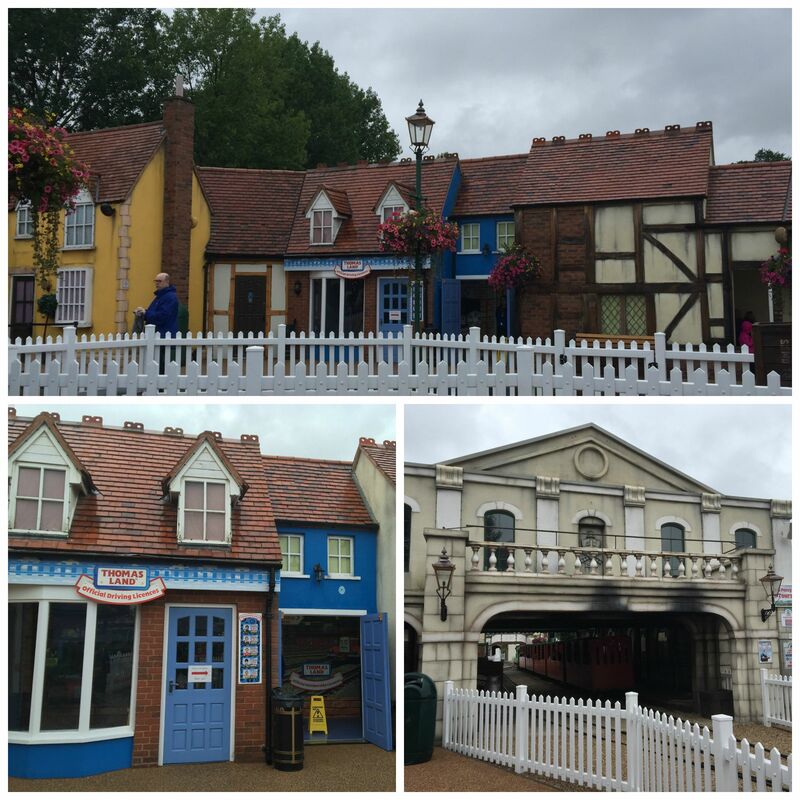 We went over to the Discover Thomas Exhibition, which Princess and I both loved, and it was all inside too – nice and dry! There was a great cafe nearby so we all had a drink too. We had a fantastic day at Thomas Land, despite the awful weather. We spent the whole day there, without even getting to the big rides in the main park. 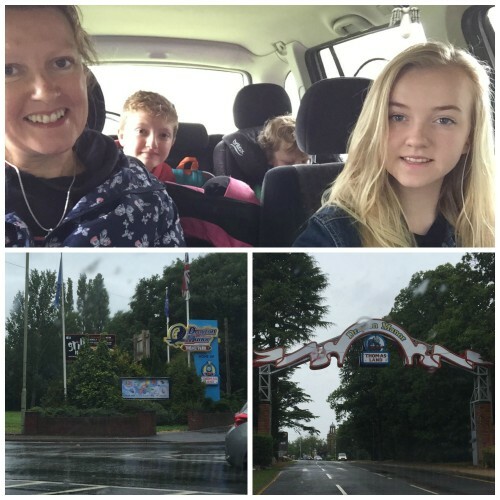 There are 8 big thrill rides, as well as lots and lots of family rides too. With a zoo to look around as well, we really needed at least another day to see it all, but unfortunately we couldn’t go back the next day. You can visit the next day for a hugely reduced price – see the website for prices and special offers. We can’t wait to go back and visit again. The perfect day out if you are a Thomas and Friends fan. All the trains, Harold, Bertie etc look just like they do on the TV! 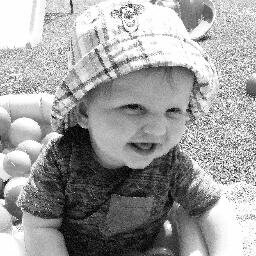 The toilets / baby changing are excellent. Coffee and snacks were quite reasonably priced. Thomas only appears to pull the train, I wish there was a ride featuring him in Thomas Land, as I wanted to go on the train from the beginning of our day, but Mummy wanted us to explore first. The toys in the shop are super expensive. I was lucky to have a Thomas Set, but it was a third more than Mummy could buy it for outside the park. Look for special offers. £3 to park the car seems a bit mean – the entrance fee is enough to pay for a family. If you want to visit again the next day, you must go to Guest Services on your first day to buy the tickets – they are just £12 each. You pay for your parking as you leave the park – there are no machines in the car park. Book online more than 7 days or more in advance for huge savings. There are special reduced prices for pregnant ladies which is a great idea. This sounds like a fun day out, despite the rain. It looks like you were all getting on very well together. Lovely. So much fun, despite the weather! Mine would have loved this when they were small. It looks magical. 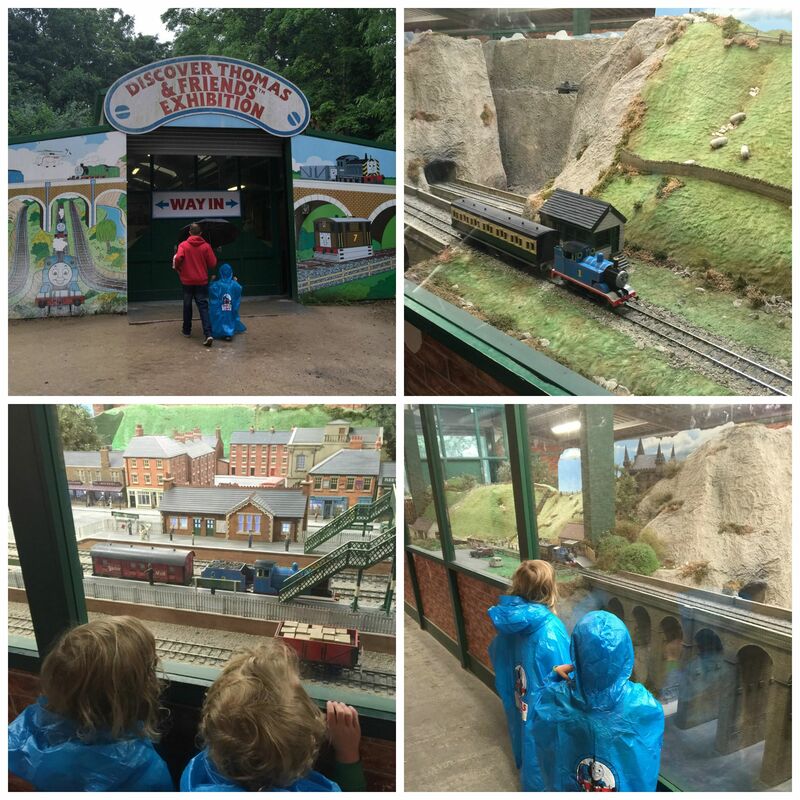 My boys both loved Thomas when they were little, I’m sure they’d have enjoyed a day out like this, even in the rain! 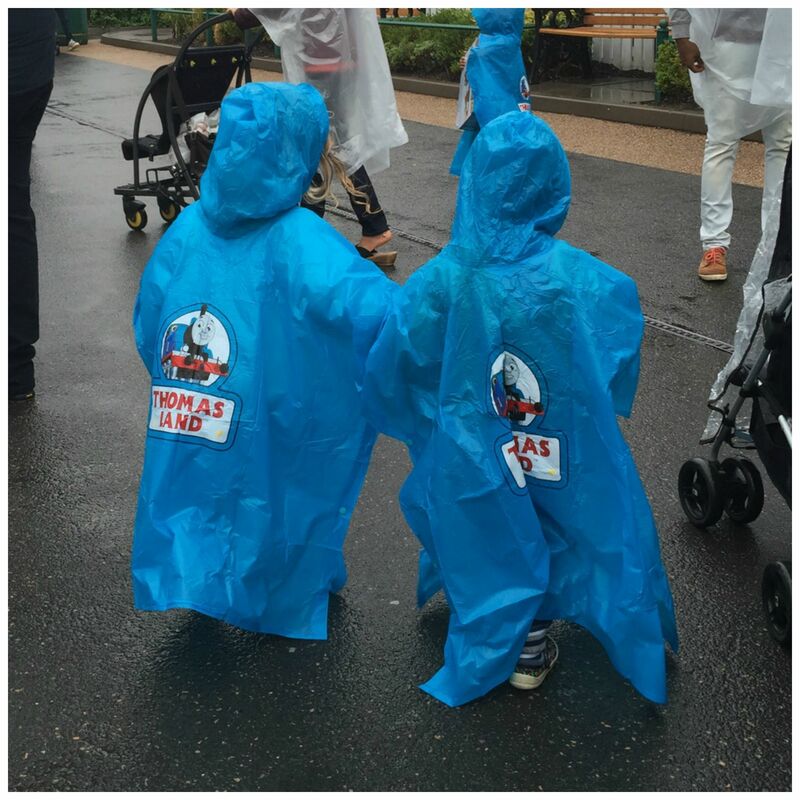 We love Thomas Land too! Glad you had such a lovely day out. Aww! It looks like you had a fantastic day, even with the rubbish weather! Kim Carberry recently posted…Blowing up Balloons….. 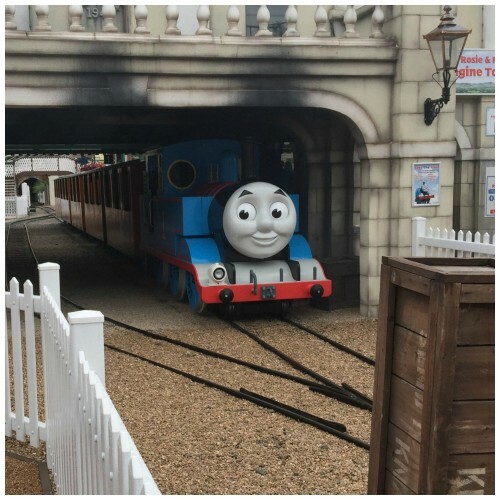 I remember my kids’ first visit to Thomasland too! 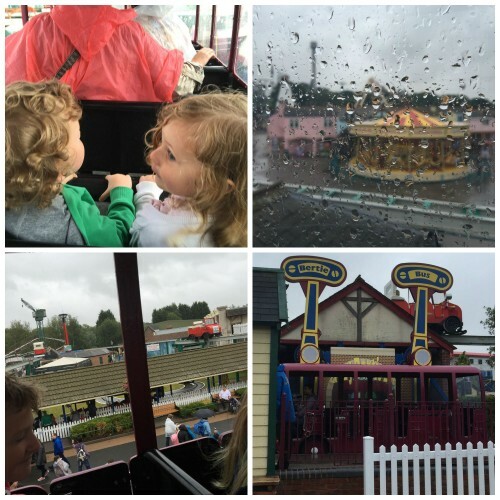 Thomasland is great fun. I hadn’t realised that they’d started charging for car parking now. That really annoys me – it’s not like you’re going to park there and go down the local shops. It’s just money grabbing. Looks like you had a great day. We LOVE Thomas Land and can’t wait to visit again very soon! Such a shame about the weather. We still haven’t made it here, but would like to now we’ve seen your pics! Shame about the weather but looks like tons of fun! My grandsons 3rd birthday as a family we went to Drayton manor park for Thomas land it was just fantastic to see his little face when Thomas pulled into the station to take us up to the zoo. It was easy to get to by road the staff were really helpful but I was amazed on how clean and tidy.